Of course, that perfection takes a bit of fuss and bother so these might not be the pancakes you’ll want to whip up any old weekday morning. Not that I ever make pancakes for breakfast, anyway. Nope, not me. There’s a reason my sister tagged me in the photo, below!! But when I’ve had a chance to get moving, especially on some snowy, winter morning when I’m not going anywhere, I’ll pull out the mixer and go to town on these! Or I might just make them for a casual dinner in front of the fire. Gently fold the batter the absolute minimum to just combine. Don’t worry about a few whisps of flour or egg white, or you’ll risk making the pancake tough. Make these pancakes small; a larger pancake won’t rise as well as the darling, little ones. Cook them in lots of butter and cook them over fairly high heat. As far as serving, I don’t care how you serve these – but do serve them. You’ll fall in love. Even if you aren’t a pancake lover, per se. But especially if you are! You might want to double the recipe and freeze half for later – reheat them from the frozen state in the microwave. These are so good, you can get away with just a sprinkle of powdered sugar, but I generally serve them with preserves or a good jelly and maybe a dab of yogurt, perhaps sour cream. And sometimes I’ll serve them for dessert with a little whipping cream. Someone, of course, will always want syrup! Originally found in Fran McCullough’s and Molly Steven’s Best American Recipes, they were credited to the New York Times. Beat egg whites until shiny and glossy and they hold stiff peaks. Gently fold them into batter; do not worry about fully incorporating them. Heat a cast iron, heavy skillet or griddle over medium-high heat; when a drop of water skips across it before evaporating, it’s ready. Melt some butter in pan (don’t be shy with it) and using a tablespoon, scoop up a bit of batter and put it in pan. Cook as many pancakes at once as will fit comfortably, turning them when they are brown. Cook the pancakes quickly over fairly high heat. Total cooking time is less than 3 – 4 minutes per pancake. Serve with powdered sugar, preserves or jelly, sour or whipping cream. Have syrup at the ready; someone will inevitably want some. You know I’ll be bringing this to our Throwback Thursday #20 Link Party, hosted by Quinn of Dad What’s for Dinner, Meaghan of 4 Sons are Us, Alli of Tornadough, and Moi! That’s right – me! Click over to our Throwback Thursday post for rules and more info or just click on the blue leapfrog, below, to view all the posts or enter your own! I’ll also be linking up with Angie of Fiesta Friday, her 101st consecutive party! Her co-hosts this week are Juhls of the Not so Creative Cook and Mr. Fitz of Cooking with Mr. Fitz. I can’t wait to see what those two come up with!! This entry was posted in Click here for Bargain Meals, Click here for Fabulous Food Posts and tagged Bargain Meal of the Week, Breakfast or Brunch Dish, Freezes Well, Frugal Hausfrau, milk, pancakes, planned leftovers, Swedish, Swedish Pancakes. Bookmark the permalink. I just love pancakes. I’m not sure that I’ve ever had Swedish pancakes but must give them a try! Oh Julie, I think you’ll LOVE them! That definitely is a bit more work than a standard pancake, but they look scrumptious! I almost never actually make breakfast, but we love breakfast for dinner. We’ll have to try these one of these nights. Hi Carlee – we had them for dinner just the other night, too. You’re right, they are more work but so good! I love pancakes! I usually use yeast, but these look just as light and fluffy as mine. I’ll have to give them a try! Funny, I’ve never made them with yeast, ever. Usually baking soda/baking powder and buttermilk is the norm, here. Now I want to see yours, Steffi! Ethereal describes them perfectly…..just so droolworthy! Thanks for sharing this wonderful recipe. Wow, these look incredible! They really do look, as you said, ethereal – great photos! Oh, this is what we call “plättar”, so yummy 🙂 We often serve them with some fruit-jam and whipped cream but butter and syrup looks pretty darn good! Thanks much, Jhuls. You’ll have to let me know how you like them! I think you’ll be a convert. Happy FF! Of course, I will. I am so excited, yay! Oh yum – that would be such a great way to eat these! These were the first things I ever cooked with my grandmother when I was a child. It’s a classic, love them. Thank you for reminding me, they are delicious. We had them with applesauce. The pancakes look delicious and I love it that you have not used baking powder but rely on the egg white to make it rise. Will try it out sometime. Happy Fiesta Friday! WOW, more caps, sorry. Those look amazing. I always wondered what Swedish pancakes were and now I know. I have to make these. Suzanne, you’ll love them – I promise!! Hi I am so glad you posted this recipe. I have been meaning to try Swedish pancakes since I tried them at a BBinn in Vermont last summer. They were so good! And yours look awesome! Btw I am just like you in the mornings too ..that’s why I don’t post a lot of breakfast recipes myself 🙂 Happy new year to you ! It’s nice to find a kindred spirit, then! Well, I hope you make them and love them, although I do have to say I’d rather be served them than make them!! 🙂 I haven’t been to a B&B in forever! 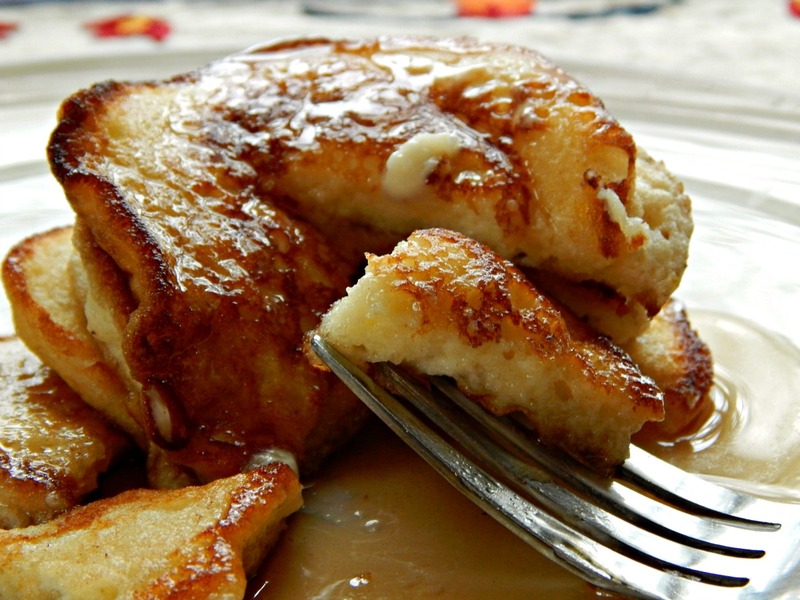 they just look so darn good, swimming in butter and syrup… how can you resist. Thanks, Abby! They’re so good, you’ll hope you’ll goof one up so you can eat it just plain and warm from the griddle as a “chef” snack!! But butter and syrup never hurt anyone, now did it??!! Lol, Mr. Fitz – I made them a few days ago when I was in Minneapolis and then when I showed my folks this post today, they were like, “Let’s have THAT for dinner!” And so we did!! I can easily see why!